T and I rarely treat ourselves to a steak dinner, so when we do we make sure to go all out. A couple of weeks ago, we tried Chophouse '47 for the first time. I'm very picky when I order a steak at a restaurant. T and I cook a mean steak at home, if I do say so myself, so it's rare that a restaurant steak can rival what we can do in our own kitchen. Chophouse's steak blew us out of the water. Our sever was extremely knowledgeable and helpful, and recommended the Prime NY Strip. Going for the USDA Prime cut was a bit more pricey, but it was worth every penny. The steak was cooked to perfection, had a salty crust on the outside, and didn't have the chewy texture that medium rare steaks can sometimes have. Better than anything that we've ever cooked at home for sure. For our second entree we ordered the Sea Bass, and went very traditional with the sides: Caesar Salad, Classic Creamed Spinach, and Cheese Mashed Potatoes. 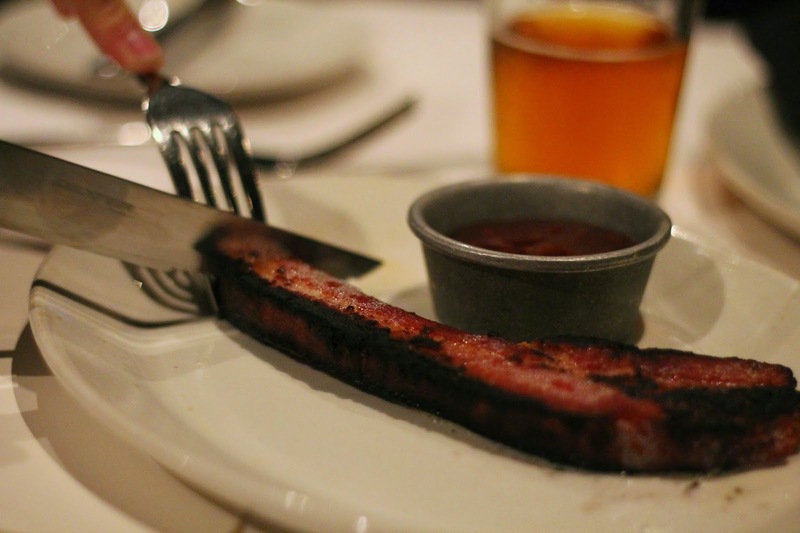 We also ordered the Thick Cut Sizzling Bacon for our appetizer, because who can resist a piece of bacon that's one inch thick? The bacon was so tender, and surprisingly not too fatty. All of the sides were executed perfectly. They were served family style, so there was plenty to take home. And they make for delicious leftovers, if you were curious. While our food at Chophouse was exquisite, the service was just as impressive. Any time either one of us left the table, someone was there within seconds to re-fold our napkin. After every course our white tablecloth was wiped clean, and our wine glasses never went empty. After indulging in such a decadent dinner, I somehow found room for dessert. T and I shared a slice of the Carnegie Deli Cheesecake, that was out of this world. We also shared a dessert martini; the perfect way to end our meal. During the month of October, Chophouse '47 is offering a dessert martini, The Pink Kiss, in honor of breast cancer awareness month. 50% of the sales from the drink are donated to the Susan G. Komen Greenville affiliate. This year a very close family member of mine was diagnosed with breast cancer, and it has rocked our world. This October has been more meaningful to me than any other one that I've had. Only a handful of restaurants in Greenville offer menu items during the month of October where a portion of the proceeds go to Susan G Komen, so I tried to support each of them during the month. If you missed out on the Pink Kiss this year, both Chophouse '47 and California Dreaming will be offering it again next October. I have always been surprised to hear people say they weren't impressed with Chophouse - it's good to read your positive review of it!! Makes me want to try it one day! 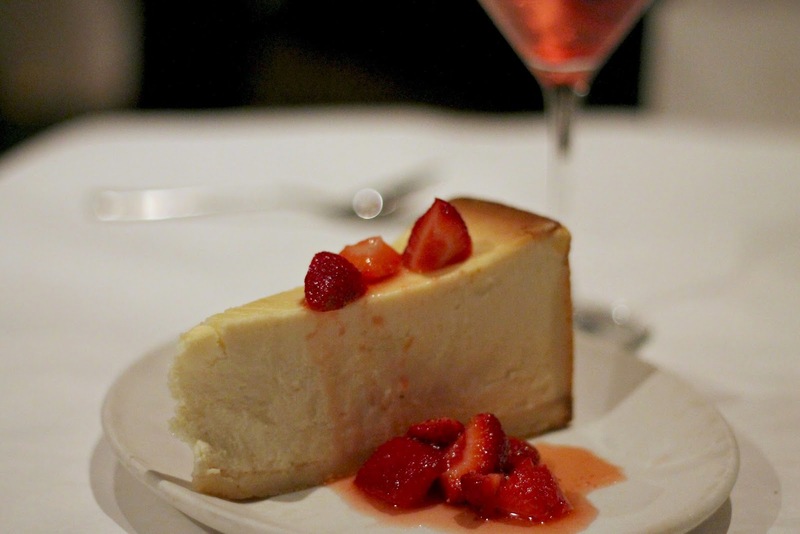 Carnegie Cheesecake is the BEST! Growing up Chophouse 47 was definitely *the* fanciest place around. Good to know it's held up well!